For those of us who happen to live in small spaces, we have to find storage and small space living hacks where we can get them. In small spaces storage and organizational tools are a premium. 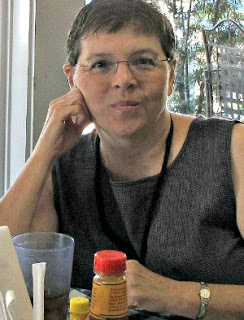 And oftentimes the space has not been geared to accommodate such challenges. So we have to find ways to deal with “stuff” on our own. I have never had a sectional, but yearn for one. I think the way it is built makes the most use of the space. No empty corner for a table. Instead it is solid seating. Every corner does not need a table! And utilize that empty space above furniture for book shelves. Every foot counts in a small space! The short space between shelves and sectional leave just enough of an area to have a gallery wall. Albeit a not very big one. Buy a coffee table that can also be used for storage. Flip the lid up and you’ve got that room inside to put stuff. A blanket for a cold night or magazines and books. 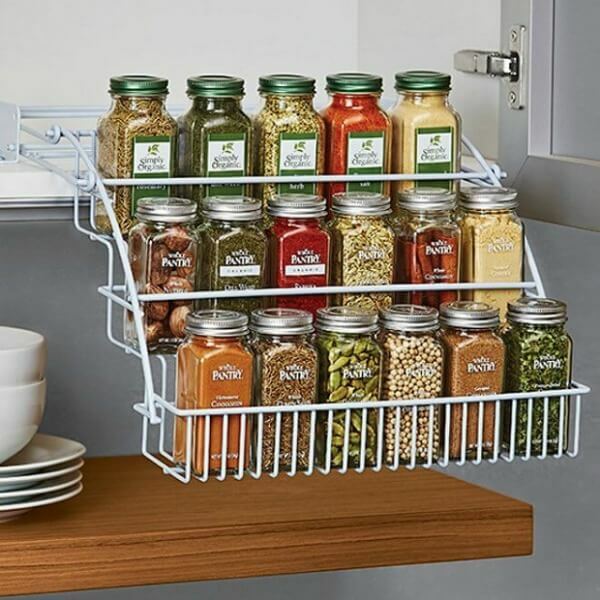 A pull-down spice rack would save you some valuable space. Anything you can get off your horizontal kitchen counter and instead hang vertically is helpful. 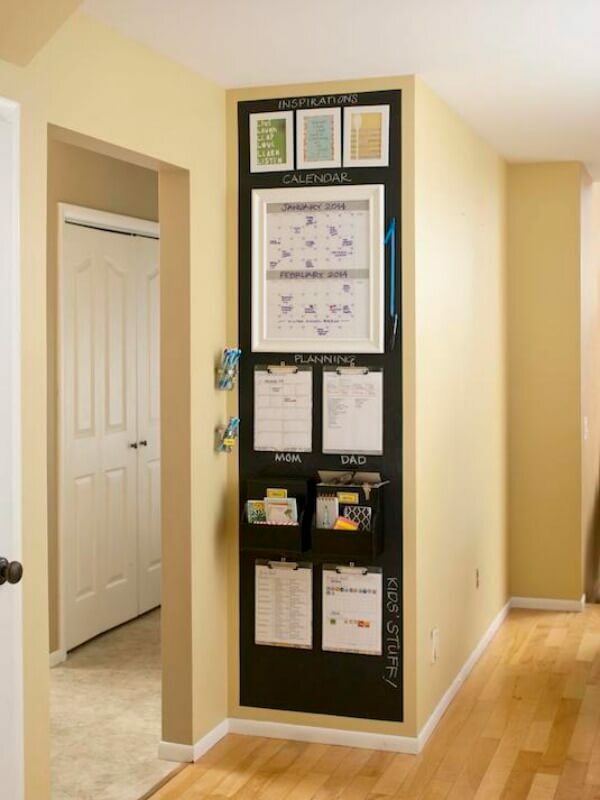 Many families need a command center to keep everyone on track and not missing appointments. This is a small space command center, in a perfect area that probably otherwise would not be used. Great use of space! 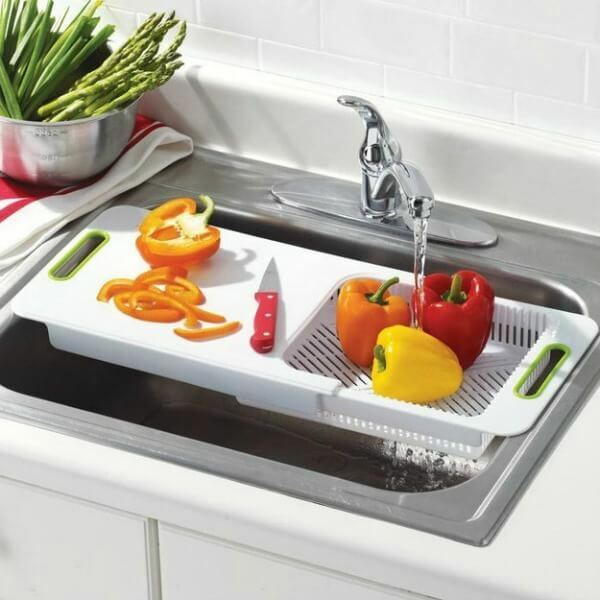 An adjustable over the sink cutting board would be mighty handy. Wash the veggies right over the sink and cut them up while you’re at it. It would also be a time saver. 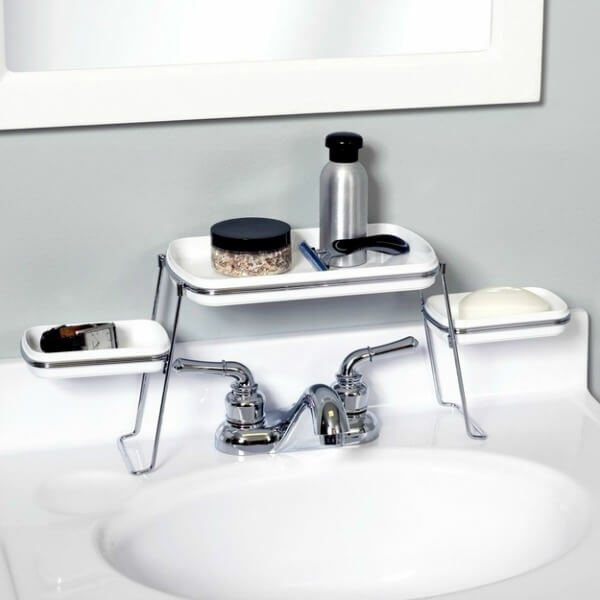 An expandable shelf that goes over your bathroom faucet frees up space as well. I love finding clever small space hacks for small space and apartment dwellers. And I’m one of them. It’s fun and creative to think outside of the box. Such fun storage ideas Brenda. I love the shower caddy for fruit and veggies too. The family command center is awesome too. Happy Labor Day. These are all super ideas. Gave me some great ideas for my little house! Definitely using the shower caddy and over the sink cutting board. Than you! When I lived in a tiny apartment a few years back I had every space saving gadget I could find!! And you know what? It was super cozy and I loved it! My landlord, on the other hand? Not so much! !